No one in Washington much cares what House Democrats do these days. House rules tend to ensure that the main job of members of the minority is to show up, vote “no” and lose. And in the next Congress, Democrats will have fewer seats in the House than they’ve had since 1929 and 1930. 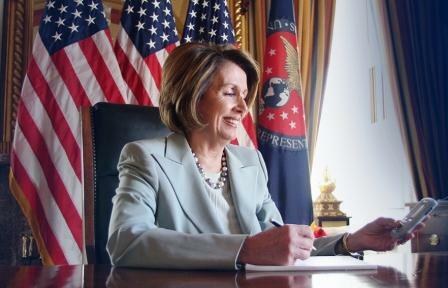 So not too much notice was directed last week at Nancy Pelosi’s first major intraparty defeat since she became House Democratic leader in 2003. She won that post by defeating colleague Steny Hoyer (they worked as interns in the same Maryland senator’s office in the early 1960s) and has been winning fights ever since. Until now. That defeat was the election by the Democratic Caucus of New Jersey’s Frank Pallone to be ranking minority member of the Energy and Commerce Committee over Pelosi’s choice, California’s Anna Eshoo. The election was conducted by secret ballot, and the vote was 100-90. Those numbers are a vivid contrast to the totals in what was probably the most dramatic leadership vote in the Democratic caucus, the contest for majority leader in 1976, 38 years ago. The winner was Texas’ Jim Wright, who would go on to become speaker after Tip O’Neill retired 10 years later. The loser was California’s Phil Burton. The vote was 148-147. Burton spent the rest of his life — he died suddenly in 1983, at 56 — trying to track down those who had committed to him but cast their secret ballot for Wright. There is a direct linkage between Phil Burton and Nancy Pelosi. Burton was succeeded by his widow, Salah Burton, who, stricken with cancer, endorsed Pelosi as their successor in 1987. Though he never reached the leadership heights Pelosi has, Burton played a critical role in changing the House. For years, liberal Democrats had decried the seniority system, which automatically made conservative Southerners and/or senile members committee chairmen. There they could and did block liberal measures from coming to the floor. After the big Democratic victory in the 1974 election, Democratic leaders conceded that the caucus could vote on chairmanships if a sufficient number of members signed petitions for such a vote. Burton organized a drive to get signatures to challenge every chairman. Nothing personal, signers could tell chairmen; we just want everyone to get a vote. As a result, three chairmen were defeated, and the principle was established that the Caucus determined chairmanships. That principle was reaffirmed when Pallone won last week. After their big victory in the 1994 election, House Republicans, led by their new speaker, Newt Gingrich, instituted a similar procedure. Chairmen would be determined by the Republican Steering Committee, on which party leaders had a major share of the votes, and there would be a (occasionally waived) six-year term limit on chairmen. Both reforms can be defended on legislative process grounds. It makes sense for legislative committees to be run by members in line with the views of the majority of the majority party. Another result: Members compete for elective chairmanships by raising money for colleagues, largely from Washington insiders. The reforms make the House more accountable to voters than the seniority system, but also more responsive to lobbyists. Pelosi has worked the new system ably. She has raised $400 million for her fellow Democrats. She supported campaign chairman Rahm Emanuel’s recruitment of moderates who matched their districts, which gave Democrats a House majority in 2006. She saw to the ouster in 2008 of Energy and Commerce Chairman John Dingell, the longest-serving House member ever, in favor of her fellow Californian Henry Waxman. She rallied House majorities for the stimulus package in February 2009 and for cap-and-trade — a favorite of Bay Area environmentalists — in June 2009. She pushed through Obamacare in March 2010. Michael Barone, senior political analyst at the Washington Examiner, is a resident fellow at the American Enterprise Institute, a Fox News Channel contributor and a co-author of The Almanac of American Politics. Now That The GOP Has Won, What Does It Stand For?